Zion Market Research has published a new report titled “Sports Betting Market by Platform (Online and Offline), by Type (Line-In-Play, Fixed Old Betting, Exchange Betting, Daily Fantasy, Spread Betting, E-Sports, Pari-Mutuel, and Others), and by Sports Type (Football, Baseball, Basketball, Hockey, Cricket, Tennis, Golf, Boxing, Horse Riding, Auto Racing, and Others): Global Industry Perspective, Comprehensive Analysis, and Forecast, 2017—2024’’. 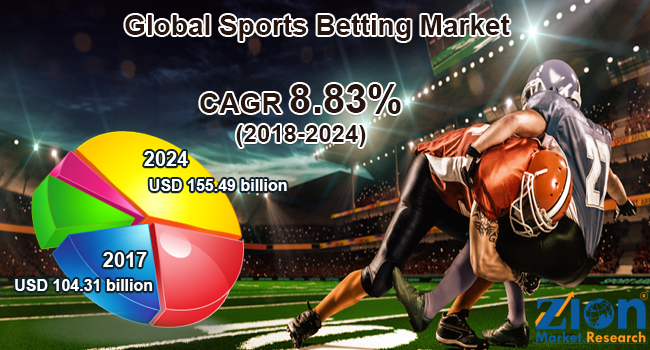 According to the report, the global sports betting market was valued at around USD 104.31 billion in 2017 and is expected to reach approximately USD 155.49 billion by 2024, growing at a healthy CAGR of 8.83% between 2018 to 2024. Based on region, this global market includes Asia Pacific, North America, Latin America, Europe, and the Middle East and Africa. The Asia Pacific region held the most significant share of the sports betting market in terms of value during 2017, owing to the growing awareness of sports betting in the developing regions of China, India, etc. The North American sports betting market is likely to witness a noteworthy rate of growth over the estimated timeframe.